People set up personal blogs for many reasons. From travel blogs designed to chronicle your latest adventures through Spain to recipe blogs for cataloguing your best dishes, these sites capture a bit your personality. 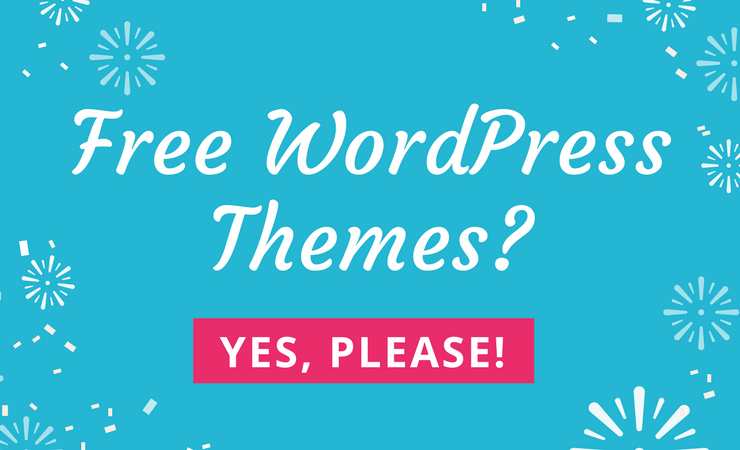 While they’re often not monetized, a professional appearance is still preferable and you can achieve that with one of these WordPress personal blog themes. Having your own blog is a wonderful way to engage with your hobbies, post information you are passionate about, and maybe even make a little money along the way. Personal blogs tend to have the same features as professional ones, or at least, they should. For instance, full-featured navigation, customization options, branding opportunities, and widgets are typical mainstays. However, most personal blog themes lack some of the more robust features like eCommerce integration and multiple page templates. All of the themes included on this list are from well-respected developers. You can rest assured that any theme you purchase or download for free has a high rating, good reviews, and lots of previous downloads. We don’t want you to waste your time on themes that don’t deliver on what they promise. Period. And with that, on to our list! The main focus of the Solopreneur theme is to help you grow your email list and build a community around your blog but it’s also great for your selling products. Two high converting landing pages on this fully responsive theme make selling products or services a breeze. The theme offers a simple, bold layout with an email subscription widget to place in your header or sidebar. All of your most recent blog posts are listed on the homepage, with large featured images, titles, and a link that users can click to leave a comment directly from the homepage. As with many blogging themes, this one provides custom widgets such as lists for recent posts and a search bar. The custom design helps you manipulate logos, fonts, icons, and social media buttons. The social media buttons are especially handy to grow your social media following and the responsive design will make sure your website looks great on any device. The theme has SEO optimization built-in, but the best way to increase your search engine rank is to regularly publish quality content on your blog. One thing to keep in mind is that because the theme is pretty simple, it remains lightweight and integrates with a wide range of plugins. Overall, we recommend it for anyone who wants an elegant and simple design. 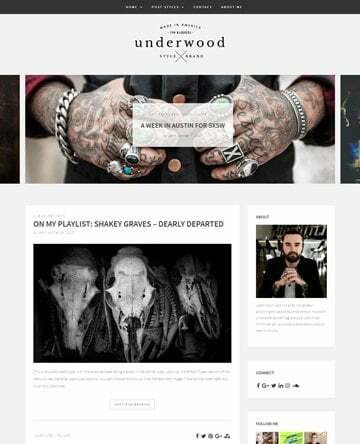 Underwood is a clean, modern WordPress theme with solid features that are ideal for the masculine personal blogger. The template offers a contemporary design along with robust features such as a bold frontpage full-width banner, 3 frontpage layout styles to choose from, and 9 custom post styles, including audio, video and gallery formats. The large logo at the top is great for branding, while the featured content frontpage slideshow makes it easy to highlight your best content. 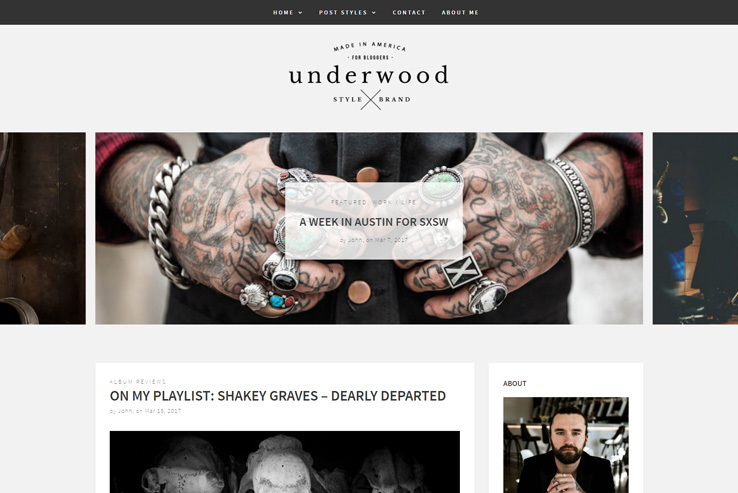 Underwood is fully customizable and easy to use, thanks to the user-friendly WordPress dashboard. Make the theme your own by styling the fonts and colors to match your unique tastes and preferences. You can also choose to have your posts with or without sidebar. With more and more people browsing the internet on their mobile devices, your visitors on these gadgets are bound to enjoy a seamless user experience thanks to this template’s responsive design. Social media has grown massively; so being on there is almost a must. Underwood integrates seamlessly with different social networks, so connecting with your audience on sites like Twitter and Facebook will be easy. Other notable features of this theme include search engine-friendly code, WooCommerce support so you can quickly sell your merchandise, parallax effects and customizable widgets to easily add various elements to your blog. 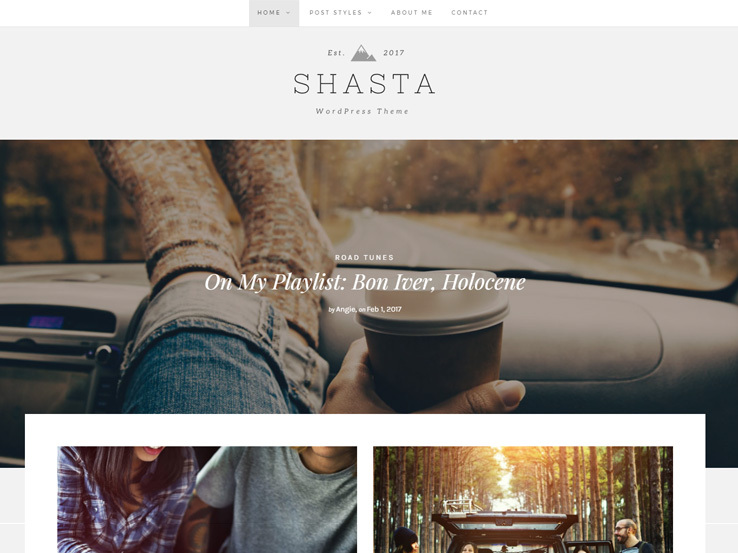 Shasta is a stylish, modern responsive WordPress theme that suits a variety of blog types including personal, lifestyle, feminine, photography, creatives, travel bloggers, and more. 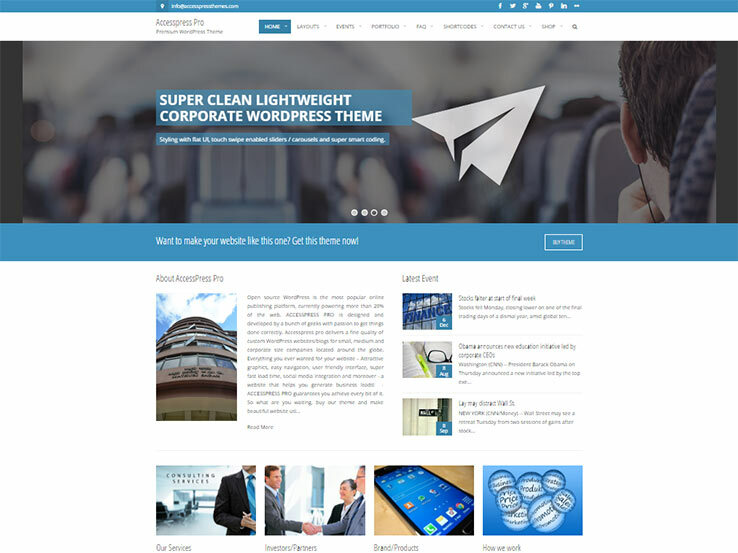 The theme features a clean and professional design with lots of white space that puts the focus on your images and typography. The logo is large and sits at the top, making it great for branding. Highlight your best content with the front page full-width banner, complete with links to the detailed pages. In terms of variety, choose among 4 front page layouts and 9 custom post formats. The front page styles include a fancy layout with large featured images, a cascading grid layout, a full-width grid without a sidebar, and a traditional blog-style design. The 9 custom post styles include audio and video post types as well as galleries with small or large image slideshows. Shasta is easy to customize according to your style and preferences. Use the powerful and intuitive theme customizer to adjust colors, content, fonts, and more. And as for social media, there are plenty of options for users to share your content and follow you, including an eye-catching Instagram feed that you can insert in the sidebar or just above the footer. Shasta plays well with all major plugins, including W3 Total Cache, JetPack, and WooCommerce. Your blog represents you in front of the audience. That’s why you need an eye-catching design to create a long-lasting impression on your visitors. Wanderlust could be an excellent choice to achieve that goal. 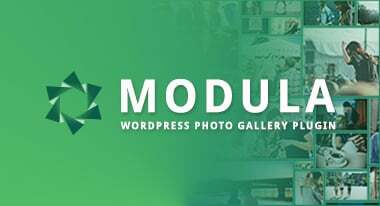 The professionally designed WordPress template comes with several home page layouts and a multitude of page designs so you can incorporate audio, video, and gallery posts. You can choose from a left or right sidebar design or go with a full-width layout. 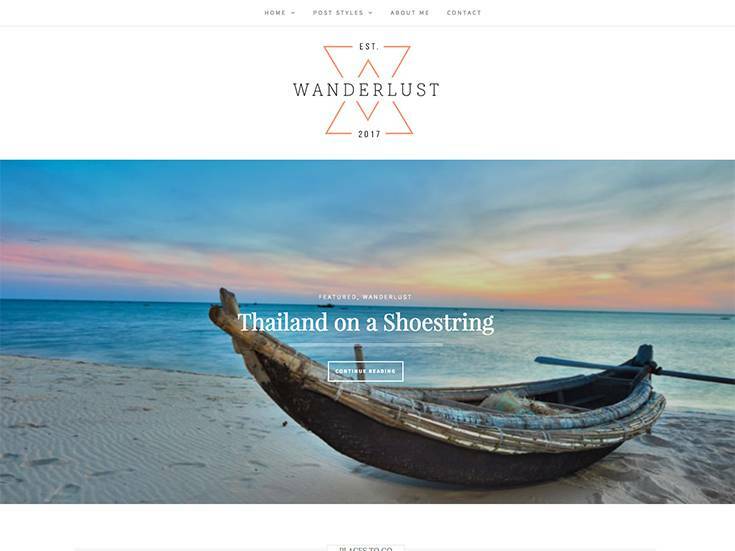 Wanderlust supports up to ten post styles and rich typography options to help you spice up the blog posts. 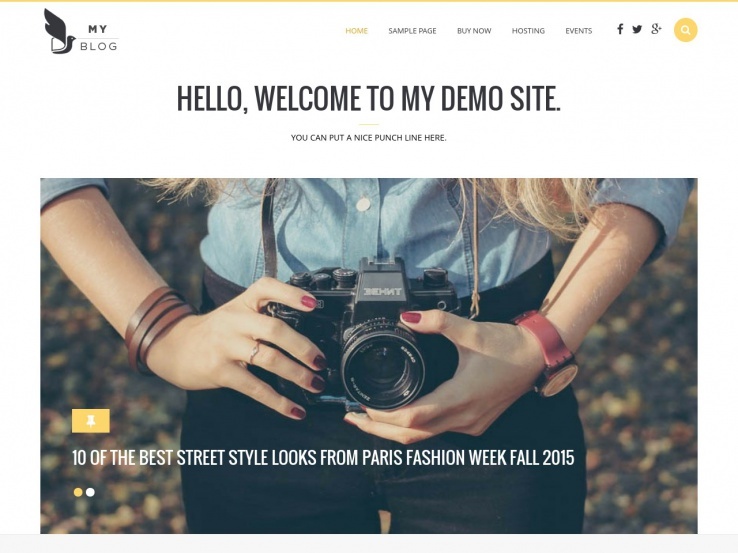 The frontpage slideshow enables you to showcase your best blog posts in a stylish way. As the theme comes with full social media integration, you can provide links to your social media profiles and get the necessary exposure for the content. The fully responsive theme is also optimized to help you get better SEO results. The clean, modern design of Everly puts the primary focus on your content, making it an excellent choice for your next blog. 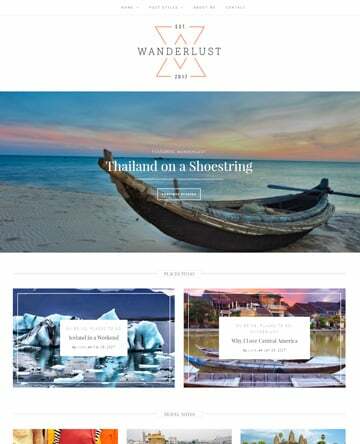 Thanks to the unique blend of design and features, you can use this WordPress template to create travel, music, food, photography, or personal blogs. Feel free to get started with any of the integrated homepage layouts or create your own design. Everly comes with Revolution Slider, which means you can easily set up and display beautiful slideshows. The built-in blocks and shortcodes will be useful in enhancing your posts. The SEO-optimized theme also supports all Google Fonts and live feeds for Facebook, Instagram, and Twitter. At first glance, Florentine looks almost like a printed magazine. 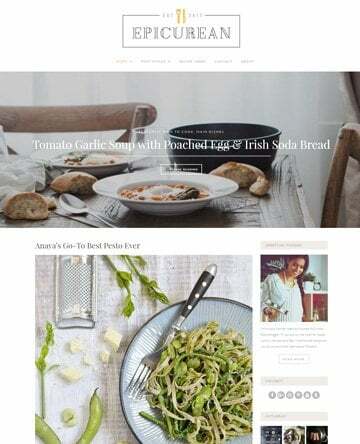 The abundance of white space, attractive typography, and beautiful images play crucial roles in keeping the audience engaged with the recipes on your site. Adding new recipes and displaying these have become a lot easier, thanks to the dedicated custom post type. Visitors can enable the handy distraction-free cooking mode with the click of a button, allowing them to focus on the cooking process. Built-in social sharing feature will ensure that your posts are getting the necessary social love as well. Feel free to use the integrated newsletter module to build up the email list. Amadeus Pro goes above and beyond when it comes to providing you a platform to share your most personal thoughts. 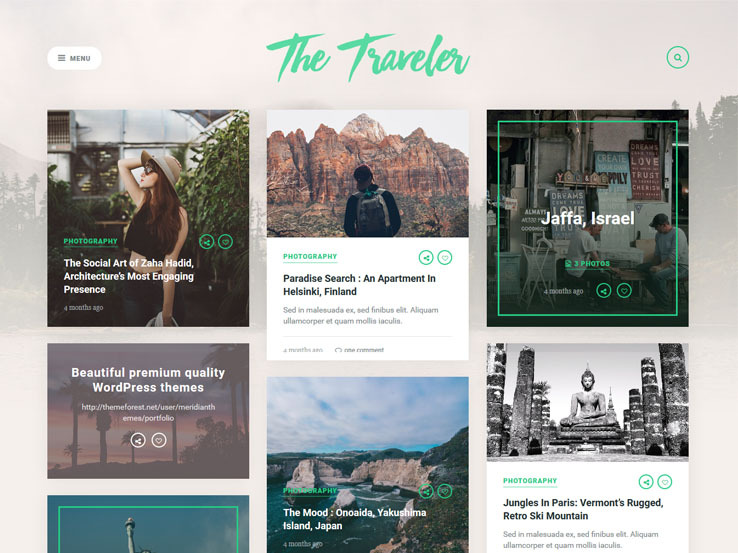 Whether you want to narrate your journey across the world, blog about your favorite recipes, or just vent about life’s daily struggles, this premium WordPress theme has you covered. For example, start by knowing that regardless of device or screen size, your content will render appropriately. More so, once someone lands on your blog, impress them with a customized homepage slider complete with smooth transitions. Ink is a simple and beautiful WordPress theme that’s a great option for any personal, photo, or lifestyle blog. The design is elegant, light, and minimal so your content can take center stage. This theme is brought to you by LunarTheme, the same team behind themes like Jakiro, and Lincoln. You can choose from among 14 unique homepages that include one-page, tiled, and masonry-style layouts to create a stylish look for your site. A beautiful content slider and other animated features are included as well, to keep your readers engaged. The high-contrast design also includes eight stunningly beautiful header styles to choose from and a wide range of blog layouts. 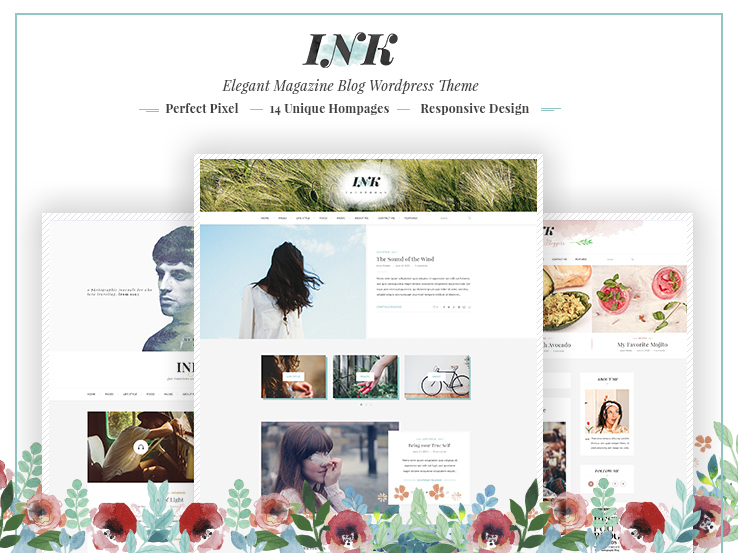 If you’re in the market for a blog theme, Ink should be on your list. The simple and organized homepage layout of The Traveler sets the mood right for your outdoorsy-type audience. Its grid-based blog layout with the hamburger menu enables you to display the latest travel stories in a stylish way. The AJAX-powered load more button will ensure that the visitors always have something to read. Social sharing options are present both on the single posts and the front page. The about author section will offer a short bio of the writer along with links to her social media profiles. The widget-ready sidebar and footer will come in handy to utilize the custom widgets. 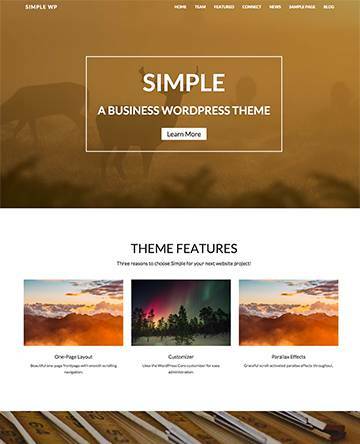 The Divi WordPress theme, from Elegant Themes, has become one of the easiest ways to get your message out to the world. Divi requires a subscription to Elegant Themes, but you get access to all of their themes as well as their entire plugin library, making the subscription definitely worth the money. The primary reason personal bloggers love the Divi theme is because it comes with a drag-and-drop builder which makes it easy to create a custom layout. This theme provides a responsive design along with 18 pre-made layouts to brand your site and stand out from the other bloggers in your niche. The Divi Builder has more than 40 modules for adding various content blocks to your pages. Divi also comes with endless header options and can be translated into more than 32 different languages. 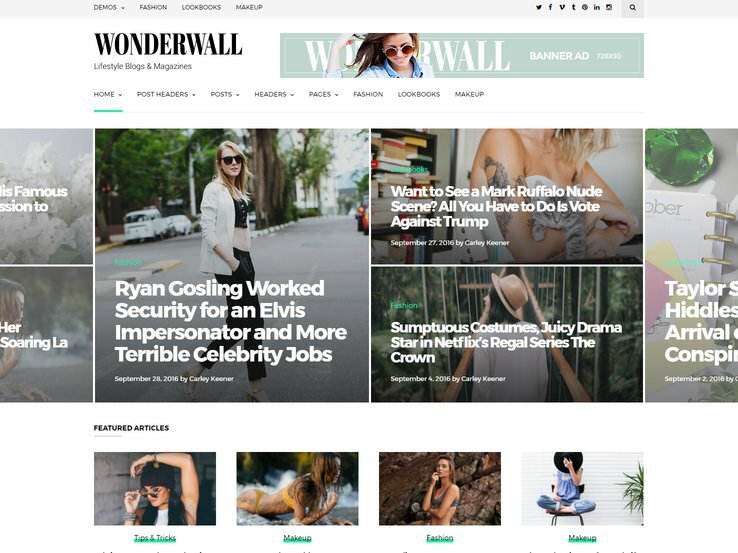 Wonderwall will instantly make your lifestyle, travel, or any regular blog look like a popular website. The carefully chosen fonts, stylish display of images, and the unique featured posts section will have a lasting impression on the visitors. Multiple menu locations will allow you to show different types of navigation menus in various areas. Thanks to the built-in banner ad locations, you can easily display ads from AdSense or other networks to earn some extra revenue from the blog. The default sharing options and stylish social media follow buttons will strengthen your social presence. 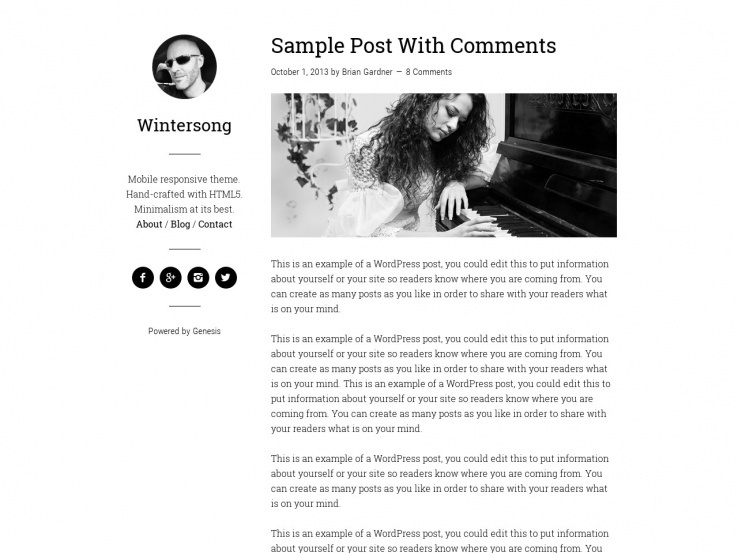 The Wintersong Pro Theme provides a unique and minimalist take on the personal blog, using loads of white space. A static sidebar which includes your profile image, logo, and most important menu items keeps your blog organized but uncluttered. 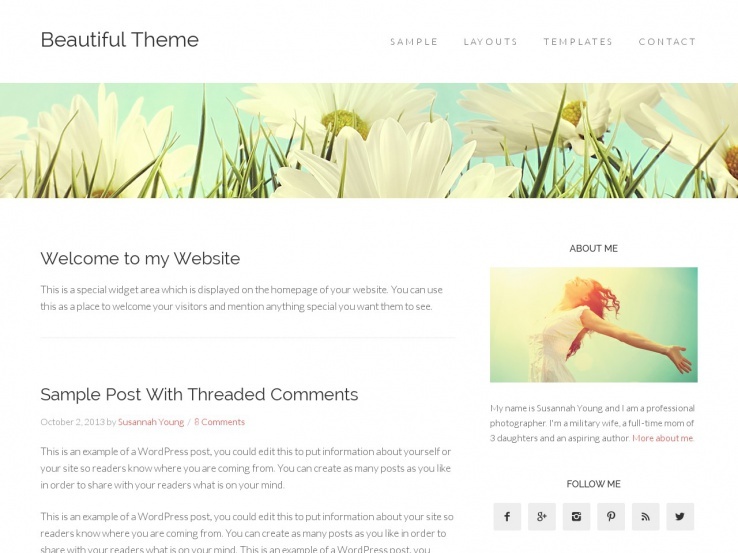 This theme runs on the Genesis Framework, which many professional bloggers use. The custom menus and headers allow for modifications at any time and the fixed width layout is ideal for making maximum use of the space. The theme is mobile responsive which means your visitors will be able to enjoy your website in all its glory even on mobile devices. The landing page template is a nice touch, and the clean theme options allow you to customize it to match your branding. The Yosemite theme, from MyThemeShop, offers an elegant and engaging interface, inspired by the Yosemite operating system for Macs. The responsive design is built to improve engagement with features like the mega menu and WP Review Pro compatibility. The theme also works well with Adsense and you can always use the included newsletter plugin to bring in more readers and connect with them in the future. Optimized for readability, Yosemite utilizes easy to read fonts and plenty of contrast so everyone can enjoy your content without having to squint at the screen. The parallax scrolling effects will grab people’s attention and the social media integration works wonders for expanding your following. 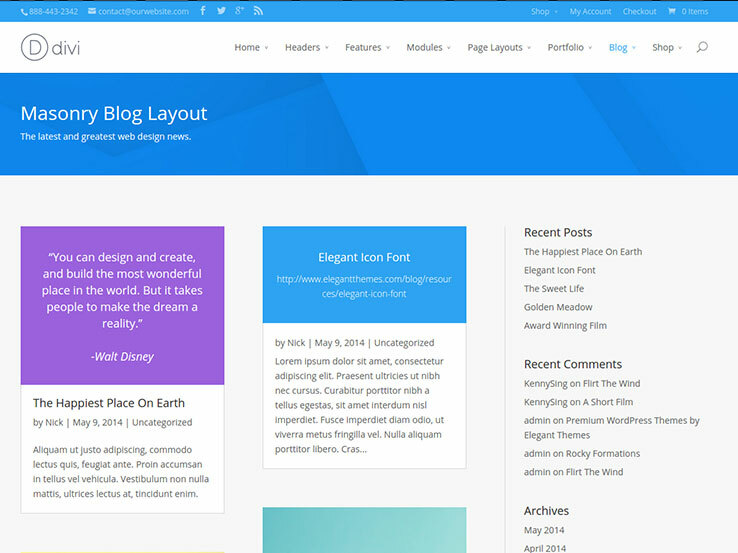 The MyBlog theme is a responsive design suited for both blogs and magazines. The design looks clean and modern while still putting plenty of information on the homepage. A related posts section will help to keep people engaged with other articles and the SEO settings can boost your search engine rankings. The theme includes a powerful theme options panel that allows you to make a wide range of changes without ever have to touch the code. If you have the skill and want to make more advanced modifications, MyBlog will let you do that too. 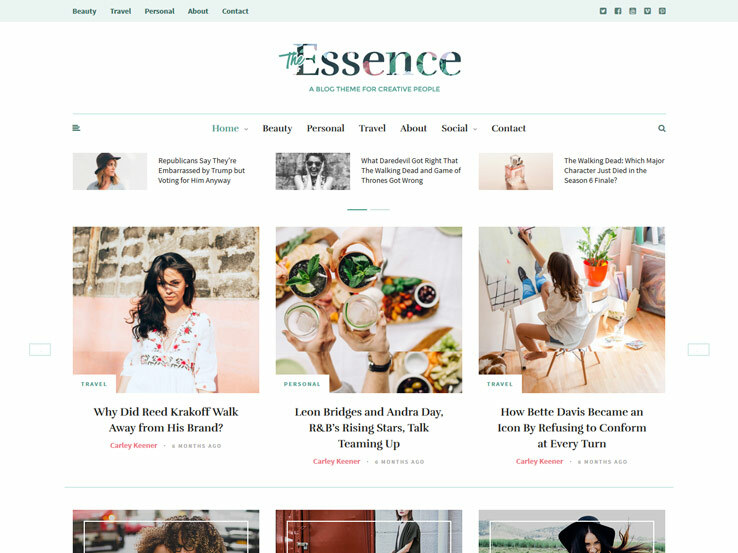 The Essence is a stylish and elegant theme suitable for any female blogger who wants lots of design options to stand out from the competition. 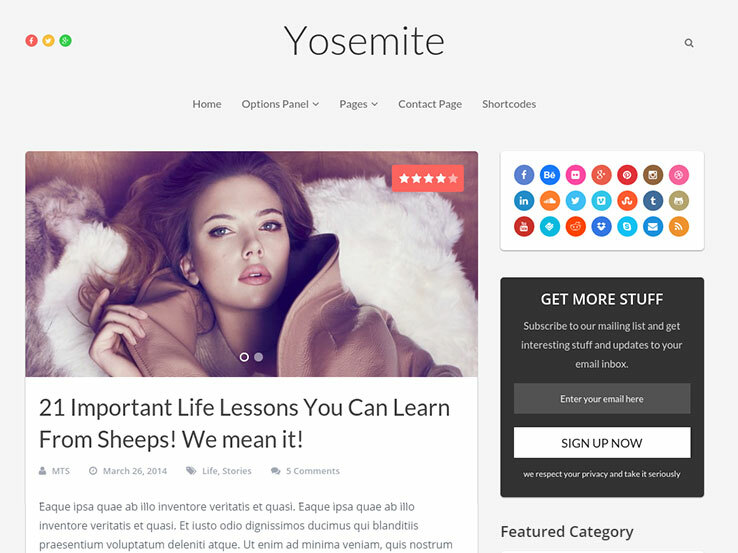 This theme comes with 17 different homepage layouts to create a look and feel that matches your personality. You can feature your Instagram photos and showcase your latest blog posts elegantly with a fantastic slider. The About Me widget is perfect for introducing yourself to your readers and adding a touch of your own style. Including your social media profiles will help to build your social following and connect with your fans on their preferred networks. In terms of customization features, you won’t be disappointed. You can easily change every aspect of the theme through the live customizer which allows you to see the changes before you apply them. You change easily change the colors to match your brand and no matter what, you can rest assured that your site will look great on any device your visitors use, thanks to the responsive design. 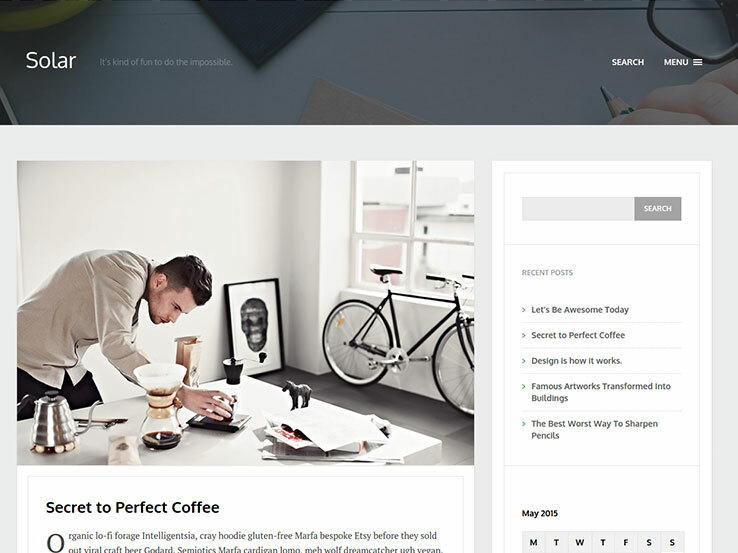 Uberto is a uniquely designed WordPress theme that will work beautifully for any personal blogger. The multitude of post formats will help you stand out in your own unique way while the custom widgets and multiple color schemes allow you to add your own brand style. The built-in Jetpack support also gives you several ways to improve performance and engage visitors. Uberto features a full-width header image with overlaying text and buttons which serve as a great call to action. The theme highlights the use of featured images and the added social media icons are a great way to connect with your audience on social media networks. 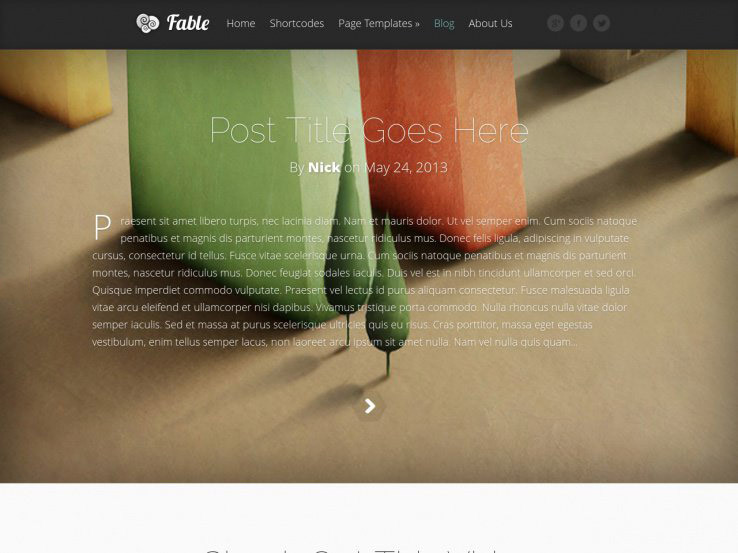 The Fable theme is another great product from the folks at Elegant Themes, built with bloggers in mind. The theme offers support for multiple post formats, allowing you to share a variety of content with your readers. The homepage features a wide screen image with overlaying text which is a great way to capture your visitors’ attention. Each post type is bolded and highlighted to make it stand out without overwhelming the eye. You can also share photos in sleek galleries, post quotes from your favorite people, and include large videos to engage your readers. 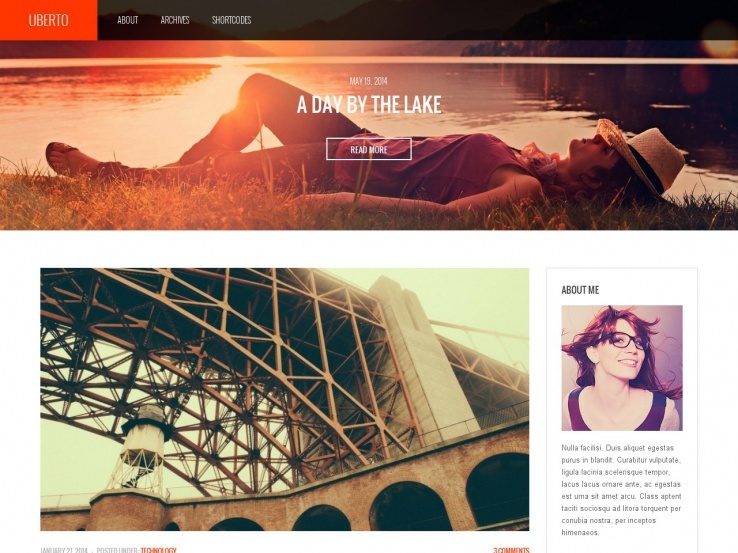 This theme works similarly to a one-page layout but it can easily be used as a multipage website as well. 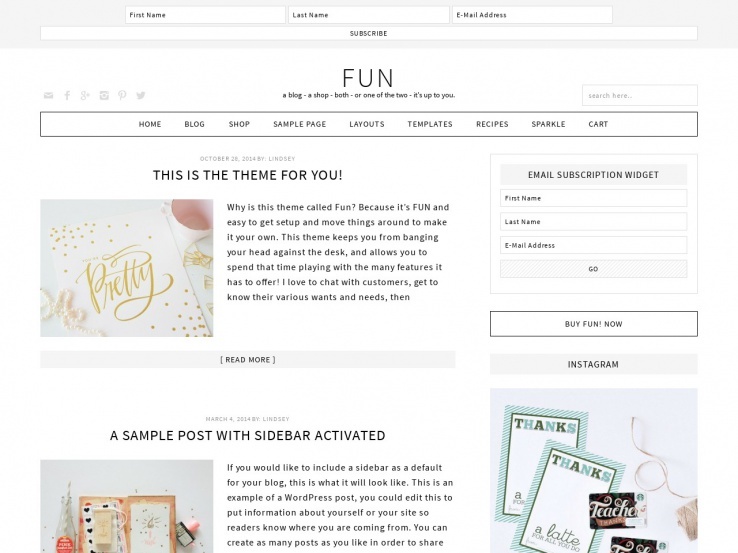 The Fun Theme provides a minimalist and somewhat feminine take on the personal blogger platform. A top feature is the more than 20 video tutorials included with your purchase to help you set up your site exactly the way you want it. 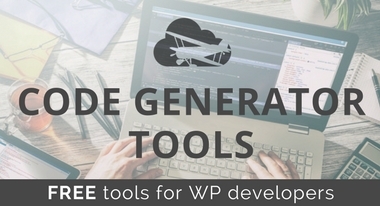 With these helpful tools, you can get straight to writing instead of building your website. The entire homepage is widgetized so all you have to do is put the desired widgets into the proper sections to create the layout of your homepage. The theme includes six different page layouts and a mobile-ready design which ensures your website looks great on all screen sizes. The theme is compatible with various tools and plugins such as WooCommerce and the Easy Recipe plugin, allowing you to offer visitors a dynamic set of options. The Grateful theme places the navigational menu on the left-hand side of your homepage, consolidating items and keeping most of your content on a single screen to keep your site uncluttered. The responsive theme provides powerful theme options that are easily accessible on the backend of your website for easy design and maintenance. The advanced typography options offer access to over 500 Google Fonts, and the custom background image feature works wonders for adding a touch of personality. A standout feature is the ability to connect with Facebook’s open graph, so whenever you post on Facebook it automatically pulls the proper text, link and featured image for easy integration across media platforms. Memoir serves as a beautiful reminder that some older style elements still work wonders in a modern blog. This is one of the simplest themes from the Elegant Themes company, yet it’s still packed with character and style. The background is completely customizable and the four unique colors are essential for adding your own style. The theme also includes several widgets for things like recent posts, categories, archives, and a calendar area. and the navigational menu is to the left which puts your content at the center stage. An array of easy to use shortcodes allow you to insert a button or column without needing to code anything and the page templates work nicely for building anything from a contact page to a gallery page. You can also enerate a portfolio to show off your most recent work, or consider running a full-fledged blog to connect with your audience. 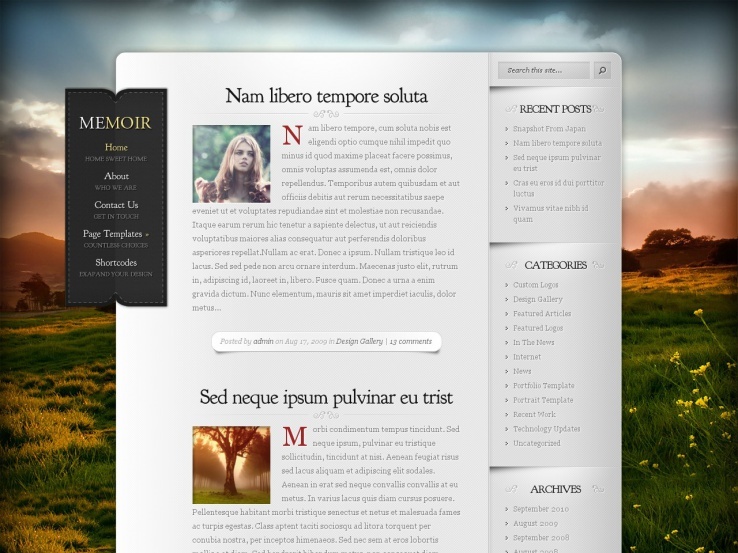 And if you’re looking to reach visitors from all over the world, the complete localization feature of the Memoir theme makes it a fantastic choice. 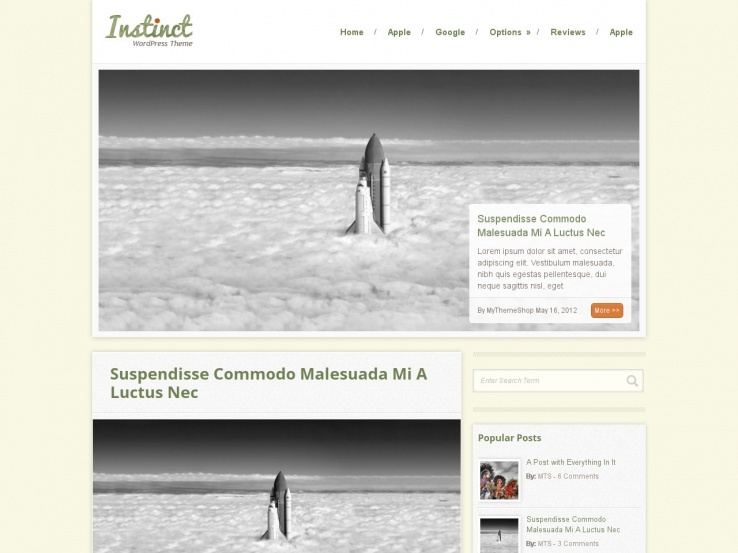 The Instinct theme has an elegant, responsive design that’s sure to make a lasting impression on your website visitors. 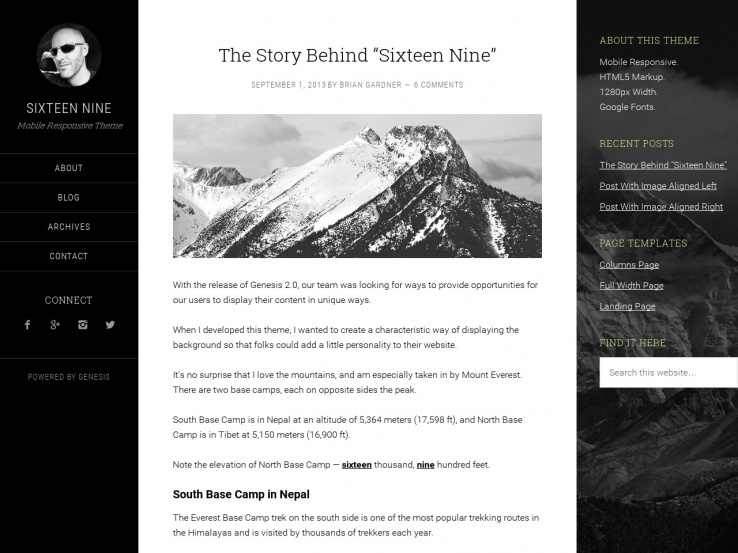 This theme has plenty of white space to highlight your content and includes a featured posts slider, which is a wonderful way to showcase your best work. The general settings area is as simple as can be, offering tools for uploading logos, changing colors, importing content, and modifying fonts. You can also add related posts widget below your individual blog posts to encourage user interaction. Custom widget use does not require any additional plugins and the various shortcodes make it easy to quickly make things like buttons and columns. This slick design is SEO ready, to draw readers to your site and capable of displaying third-party ads to monetize it. The custom email sign up form will help you grow your email list; social media buttons are another are great way to build your following and connect with your audience. The Beautiful Pro Theme, from StudioPress works with the top notch Genesis Framework, one of the easiest ways to customize a site as much as you want keep all of your changes when a theme update is released. Beautiful Pro truly is a beautiful, simple solution for your blogging needs. It offers a custom header for branding your site and includes a welcome message area where you can tell people what your blog is all about. The fixed-width layout keeps the focus on the content in the middle and site navigation is a breeze with the custom menus. The landing page template included with your purchase will help you get started with speed and style. This theme is completely responsive and comes with fantastic options that allow you to upload logos, change colors, and make many other changes. Site visitors will stay engaged with your content through sidebar widgets for sharing featured posts, and displaying Instagram photos. Several social media buttons and a widget for collecting emails will keep you connected after they leave. The theme also includes several ad areas so you can monetize your website. 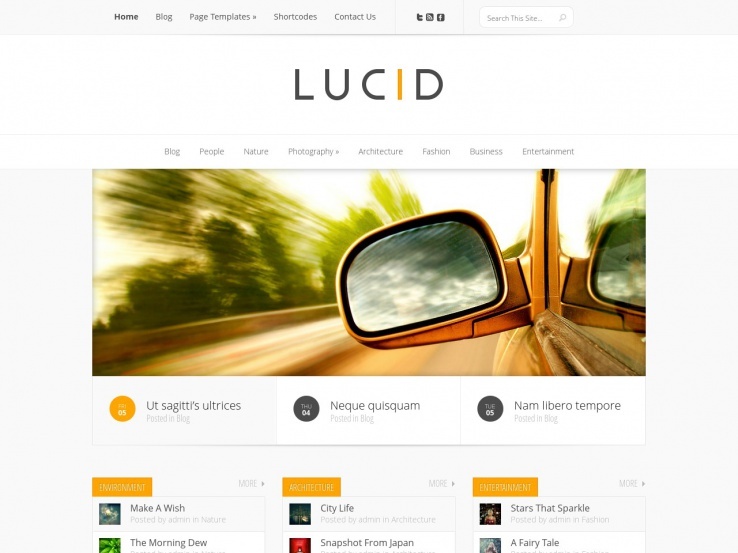 The Lucid WordPress theme, from the Elegant Themes company, provides a clean, sleek take on blogging themes. 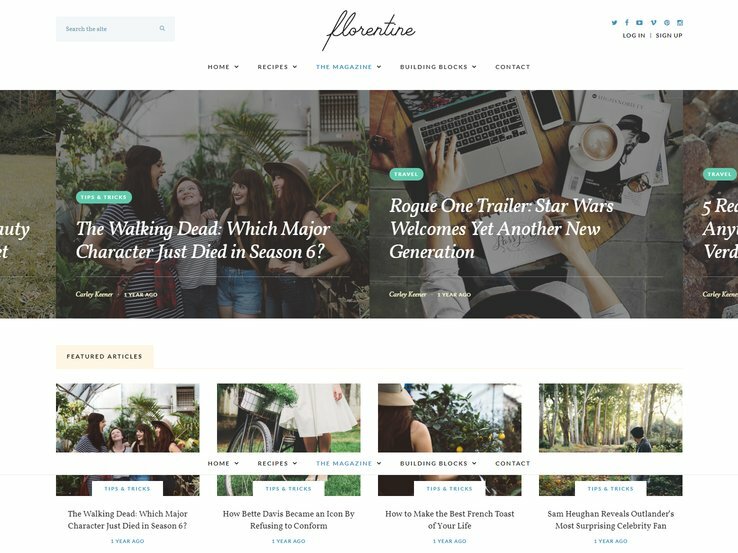 The magazine layout is perfect for an ambitious blogger who is ready to share tons of stories about a particular subject, such as travel or lifestyle. You will have a gorgeous, personalized site in no time with the theme options panel’s customization settings along with shortcodes for adding elements like toggles, buttons, and columns. Lucid also includes various page templates for such features as contact and login pages, as well as five unique color schemes. The slider is an ideal place to feature your latest or most popular blog posts while the social media buttons will keep you connected to your fans across the web. The localization files allow you to translate your website into any language and the responsive design ensures that anyone on a mobile device can still enjoy the beauty of your website. This theme also comes with frequent updates and secure code for a fast and simple way to maintain your website. Overall, the Lucid WordPress theme offers a multitude of features paired with a stunning design that’s sure to grab the attention of anyone who lands on your website. If you’re familiar with the StudioPress Genesis Framework system, you should definitely consider the awesome Sixteen Nine theme. This framework is one of the best for customizing your website and the Sixteen Nine theme is a great choice for anyone who wants to build a website that puts an emphasis on content first. The two layout options will add great variety to your website design but you can be sure that it will also be easy to navigate with the custom menus. The landing page is ideal for featuring your services or products or for promoting your email list. Your website will be a perfect fit after you upload a custom header and a custom background to incorporate your own branding elements. This theme guarantees a well organized look with a menu that sits on the left-hand side of the page and an option to implement a large set of widgets in the other sidebar. The responsive nature of Sixteen Nine makes sure that all of your content and design elements will also look great on any device. 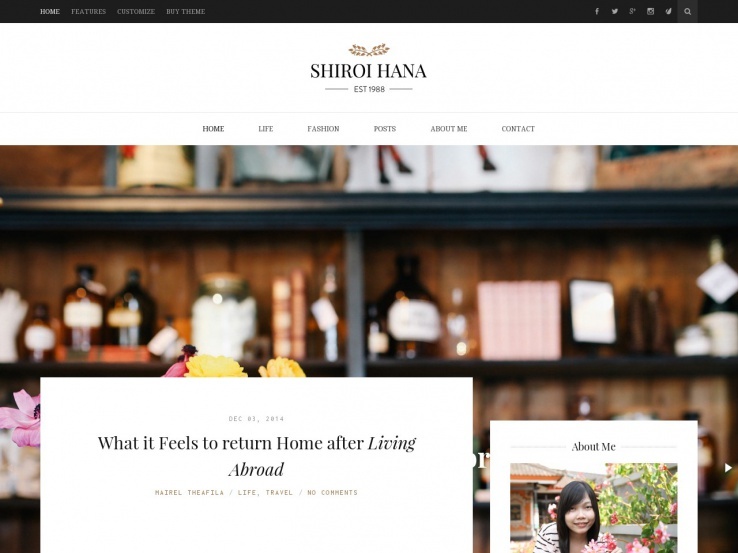 Shiroi Hana is a beautiful and responsive theme that’s sure to impress every visitor who lands on your blog. The standout feature of this theme is the full-width slider that features your most popular posts from several categories. The slides have a dynamic and engaging animation effect for post titles and can include a button to take readers to the full post. Each post includes a large featured image but you can keep things really interesting with galleries, videos, audio posts, and more. Your site will be fully featured with a sidebar for widgets like your social media icons, a search bar, and Instagram feed. Shiroi Hana fully integrates with the WordPress Live Customizer to customize colors and fonts, while the advanced page builder makes it easy to create unique layouts. Shortcodes are available as well to add elements like buttons, lists, and columns. With these tools you can easily build a unique site without any knowledge of coding. This theme is also an outstanding choice for reaching a wide audience with translation files and a design that will look wonderful on smaller devices. AccessPress Pro is a multipurpose theme that’s excellent for bloggers who are also looking to market their services or showcase past work to potential clients. A wonderful slider at the top gives you an ideal place to feature your latest posts along with a text overlay and a call-to-action button to read the post. You can use this feature to promote any upcoming events, showcase your past projects, and provide a list of testimonials to show your credibility. The homepage demo is geared more toward small businesses but you can easily customize it to suit your needs with the page builder and theme options panel. Simply leave the Revolution Slider at the top and replace the bottom sections with a grid layout of your latest posts. 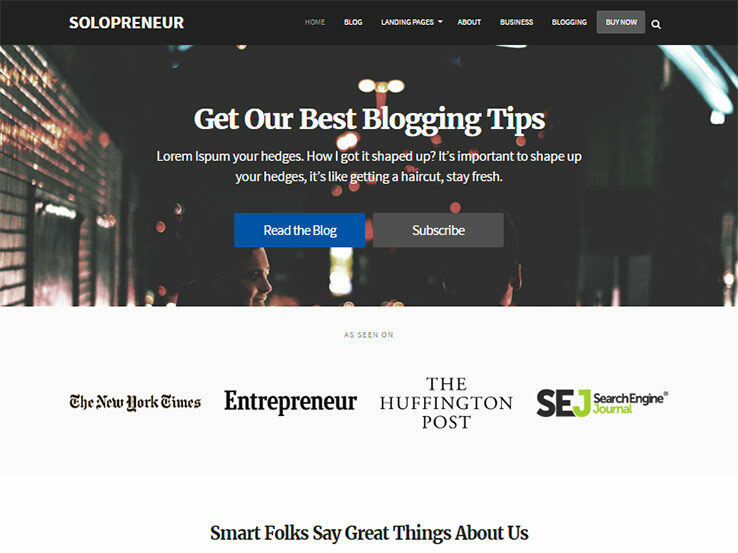 There are also several fantastic looking layouts for your blog posts. Pricing tables and the WooCommerce plugin making selling your products and services simple and clients can easily reach you with further questions through your contact information. Several shortcodes reduce the need to use code and the responsive design ensures your blog will look great even on smaller devices. All things considered, AccessPress Pro has all the tools you need for a successful blog. Qoon is a perfect solution for creative-minded bloggers, like designers, photographers, creative agencies, who need to showcase their portfolio. 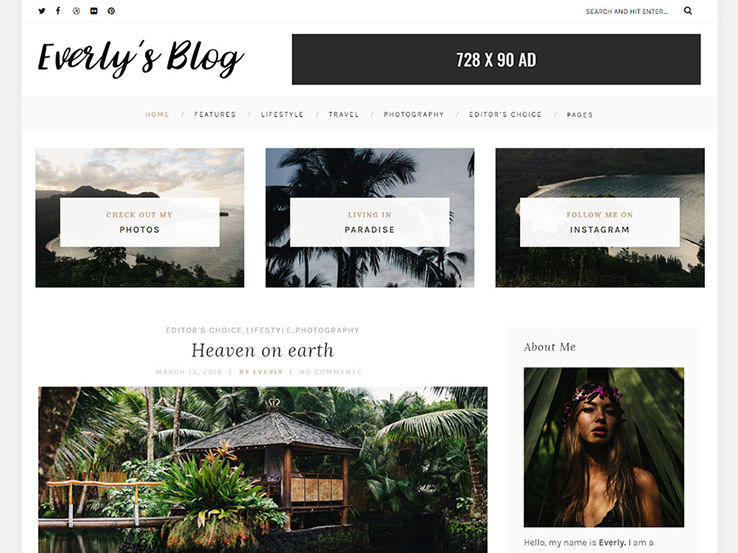 With several demo layouts and a heavy focus on imagery, this theme is super versatile and a great fit for almost any blog. Food or travel bloggers, who often include lots of images on their blogs, will love the stunning portfolio options. There are also several excellent choices for your blog layout such as a single column layout, a masonry grid layout or a standard two column layout with large featured images and a brief description of your posts. The Revolution Slider allows you to create beautiful slideshows and you can also easily customize your typography to add a touch of elegance to your website. Unlimited color options are a great way to integrate your brand into your website, while the drag and drop page builder makes it easy to create pages without touching a single line of code. Along with responsive design, several shortcodes, and SEO optimization, the Qoon theme has something for everyone. The best content in the world is worthless without the right presentation to attract readers’ attention, which is why Sapphire from ShapedTheme is such a great choice for your personal blog. Everything about it screams lifestyle-oriented and provides a clean layout in which you can present your very best blog posts and photographs. Image-centric posts would do well in this theme thanks to the inclusion of a Featured Posts Revolution Slider, large featured images, and Instagram widget. Customization is a snap here as well. Sapphire comes with 12 different homepage layouts, over 650 Google Fonts, multiple skins, and a visual customizer. This theme is also translation-ready and comes with full documentation and support. 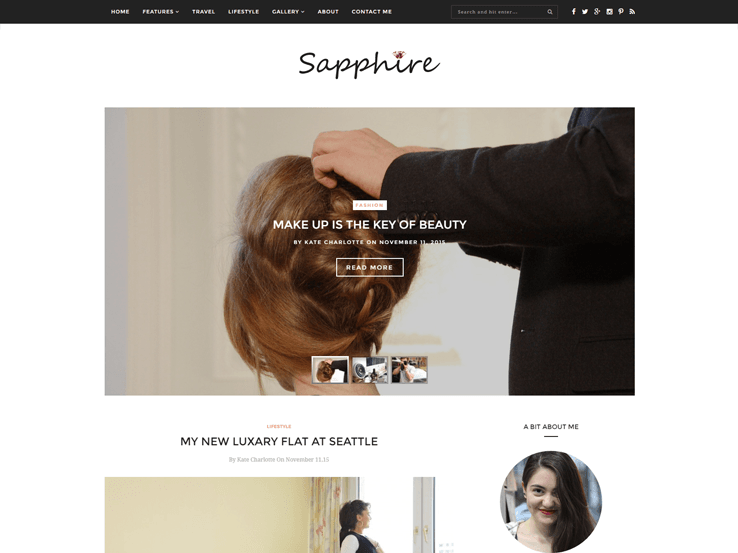 Ideal for lifestyle, travel, interior design, food, wedding, and personal blogs, Sapphire is ideal for building your next beautiful site. Family Blog is a beautiful, simple, and personal way to share your family’s life online. 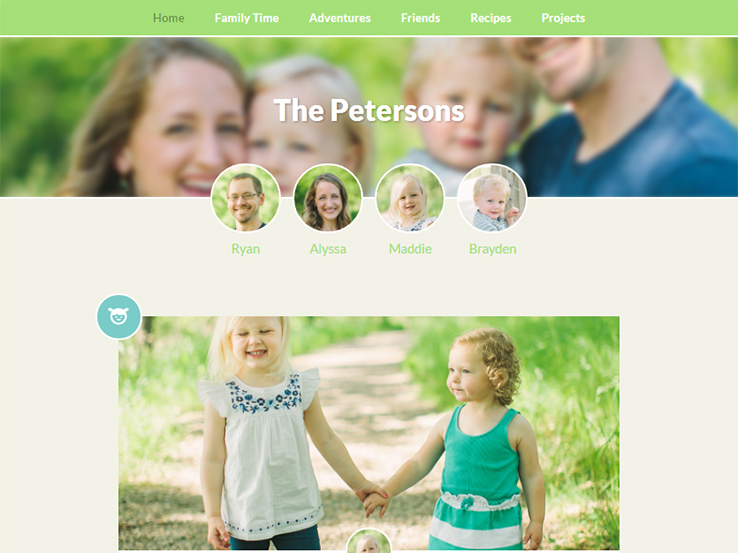 It’s the perfect WordPress theme for mommy bloggers, proud dads, loving grandmas, household paparazzi, and family storytellers. Each family member (moms, dads, kids, dog and all) can have their moment in the limelight with their own profile. They can be tagged in individual posts, letting their personality shine through the page. For each post you create, tell a story with beautiful feature photos, put-together galleries and individual icons. You can even find new icons from the Internet and upload them to your collection. WordPress Family Blog can help you elegantly showcase your family photos, cute stories, and everyday life with family, friends, and the world. Solar is a personal blog theme from ThemesKingdom, with a strong focus on imagery to present your content in style. 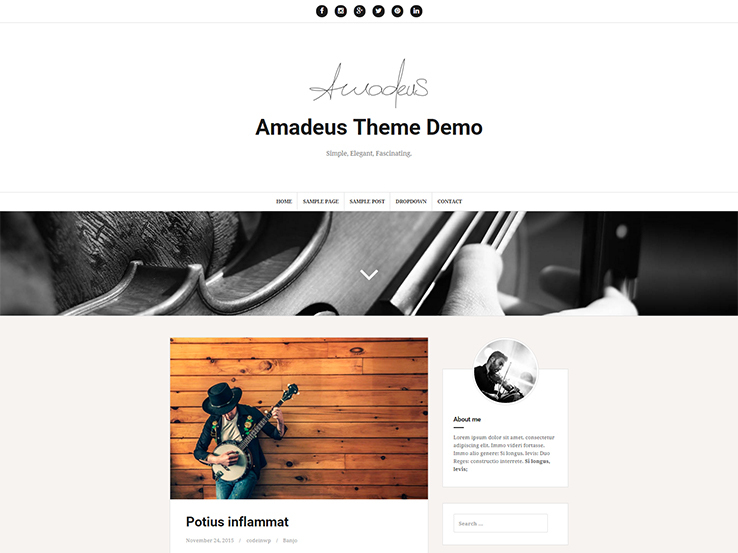 This theme goes back to the original WordPress roots with a sharp and modern design, without all the bells and whistles you see in many blogging themes today. The responsive theme includes sleek advertising banners so you can easily monetize your website and add extra visual appeal with FontAwesome icons. 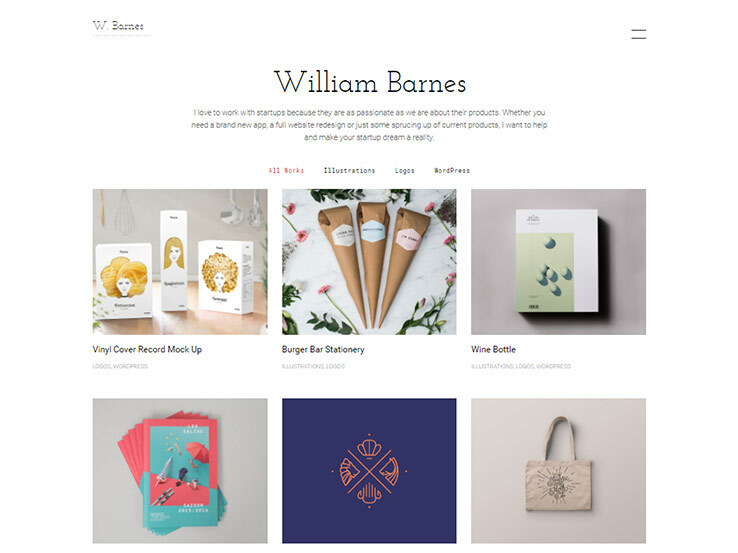 Choose from various page templates to build pages for portfolios, contact forms, and blogs. The shortcode generator makes it easy to add extra elements to your pages and the Google Maps integration serves as a wonderful way to send people to events or physical store locations. Thank you very much in advanced for your listings. http://www.themes-ilgelo.com/mani/demo/ What do you think? Oh these themes are just eye catching. Thanks for sharing such useful lifestyle blog themes.These helps a lot to write lifestyle blogs. This list of themes is great. For last couple of months I’ve been changing my site’s theme every week and I’m still not satisfied, something is always missing. I think I saw here a theme or too that might finally be perfect for me. I will update soon enough. Thanks for the great list of themes. Absolutely versatile and appealing collection…thank you for this. We use the Divi theme on a lot of our client’s websites. We love it so much we switched our own website to the Divi theme. Not only does it look awesome, the performance is so much better. Thanks for sharing! I agree, Divi is definitely one of the top performing themes out there. We are constantly hearing good feedback on it. Thanks for sharing! Glad to hear Cassia worked for you! Hi, I want suggest a minimalist beautiful and free WordPress theme for blogging. Thanks for the suggestion. We will check it out. I dugg some of you post as I thought they were very useful extremely helpful. Great! What theme did you decide to use? Thanks for the feedback! Glad you enjoyed the content. Just wonderful collection, most of them are so nice that now I am confused which one to use for my WordPress poetry blog. By the thank you so much. Hi Veronica, Glad you found this helpful! 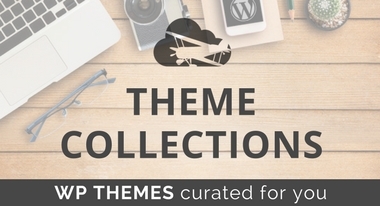 With so many quality themes, I can see why you are having trouble picking one. Which one did you decide on? The Cheer Up theme looks fantastic. Considering going ahead and purchasing it right now haha. Divi Theme from Elegant Theme is great. I have used it for my own website. But at first time when I installed it, I was facing some problems then I contacted with support but no response from Elegant Theme support team. I just shocked about this and I had to fix it myself. Thanks for the feedback! Did you have a favorite theme you found on this roundup? Glad you found the article helpful! Did you find a theme that you were interested in using? What words i use for you but one word is very very good list of blogs. Thanks for share with us your hardworking. Very nice and interesting article. 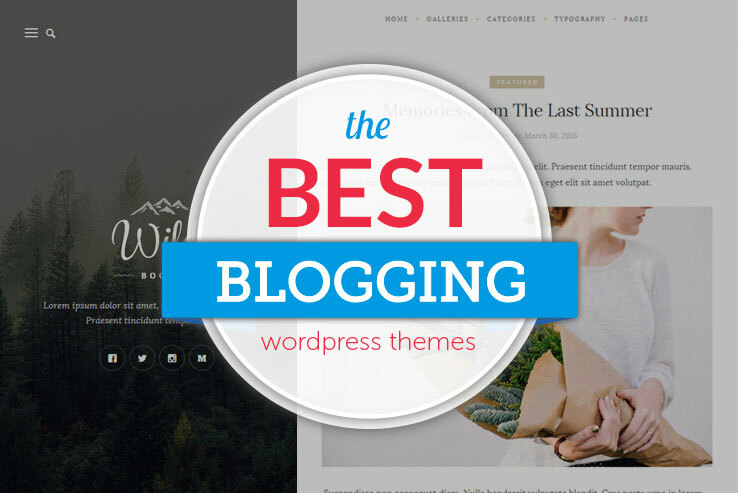 You can also add our themes which are amazing and beautiful blogging theme. Thanks for suggesting Elanza and Glowline for our roundup. We will definitely be checking them out. Great! Did it help you? Thank you very much for this list! It is an insanely huge help! Glad we could help. Which theme did you decide on using?